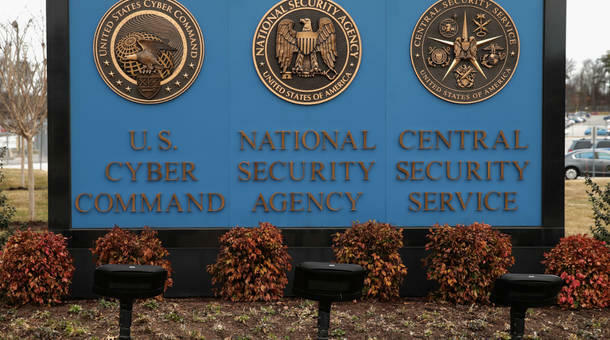 The seals of the U.S. Cyber Command, the National Security Agency and the Central Security Service greet employees and visitors at the campus the three organizations share in Fort Meade, Maryland. A government contractor who was arrested in August is accused of taking top secret computer code designed to help the U.S. hack into foreign government computer networks. Harold Thomas Martin, 51, worked for Booz Allen Hamilton, the same private consulting company that had employed Edward Snowden, who released a slew of confidential data to journalists in 2013. The repeat theft is raising questions about how much access contractors should have, but experts say the reliance of government intelligence on private companies is ingrained. According to the latest report from the office of the Director of National Intelligence, there are more than 1.3 million people with top secret clearance. More than 445,000 of those are contractors. Booz Allen lists a worldwide force of about 22,600 employees. The company made more than $5.4 billion in revenue last year. The company's investor page states that it has been trying to expand more into commercial and international markets, but government contracts are the company’s meat and potatoes. The government's heavy reliance on private contractors can lead to more difficulty in ensuring top secret information remains secure, said Scott Amey, general counsel for the Project on Government Oversight. “The more portholes you have on a ship, the more at risk you are to leaks, and I think this is another instance of that, in which the more contractors we have coming in and supporting government functions, the harder it is to manage, to administer and oversee contractors and the information that they’re handling,” Amey said. Contractors are often seen as more affordable when it comes to carrying out tasks the government outsources to them, though Amey said he believes that assumption needs to be rethought. “There has not been a study to take a look at those issues on whether we’re getting bang for the buck when we outsource work to contractors, and I think there needs to be one,” he said. As for security improvements, James Lewis of the Center for Strategic and International Studies said the NSA put in a lot of protocols three years ago -- things like locking out computers and alerts when something gets downloaded. After all, Harold Martin was caught. In the meantime, Lewis said scrutiny will likely go toward improving vetting and keeping tabs on those who gain top secret access. “What people will probably do is think about how do we improve our clearance systems? How do we improve our defenses against people being able to download stuff they shouldn’t have access to? And how do we maybe keep a closer eye on people’s behavior to know when they might have changed their minds and decided that they valued money over security?” he said.